Microsoft Exchange for the everyday schmo! 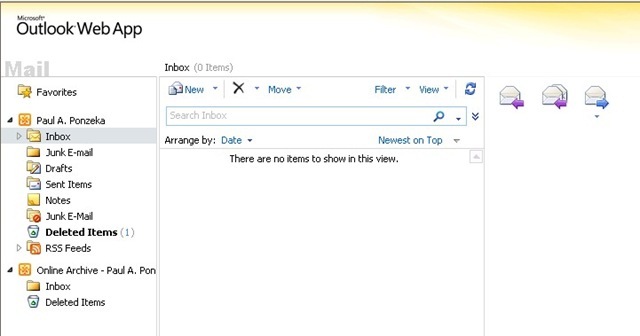 Also, after Exchange 2010 SP1, archive mailboxes can be placed in a separate database. PST’s and Mailbox Limits. Those two items keep Exchange Administrator’s up at nights. One of the biggest battles between the end users and the administrator is mailbox size and retention. It’s pretty well known that the bigger the mailbox get’s, usually the worse the performance gets. Admins have been trying for years to get users to get their mailbox size down, and users always fight back. With the dramatic changes that the Exchange Team has made to the Mailbox Store in Exchange 2010, it is now possible to have huge mailboxes’ (10GB+) to support the growing need’s of our end users. Problem is, we still want to get the best performance possible out of our mailbox’s. For archive purposes, the only “built in” solution from Microsoft was to export data to PST files. PST files though are not managed by the organization, are prone to corruption, not accessible through OWA, and are generally messy. Company’s were forced to move towards 3rd party utilities to satisfy their archiving and compliance needs. Word on the street is that Microsoft is working on a plug in or an update to Outlook 2007 that will allow the older version of Outlook to access the Archive Mailbox. Still, many companies have an Office 2003 installation that will be hard to uproot to 2010 for this feature. The second point I think is the one that really hurts this feature. The fact that the archive mailbox is part of the same database as the primary mailbox. I understand that in 2010, the IOPS requirement has been dramatically lowered, and now the organization can run on SATA or Tier-2 disk’s, but many company’s want to segregate their data onto different tier’s and speed of storage. I think this aspect of the feature will end up hurting Microsoft. Let’s see if they make a change in the future. I digress. The Archive Mailbox is essentially meant to replace the use of PST’s. The best part is you can drag data from existing PST’s into the archive, just like you can drag messages from your inbox to the archive. But the real power is setting this up to be done with policy’s, called Retention Policy’s. As administrator’s, we can control the length of time that users are allowed to keep items in their primary mailbox. 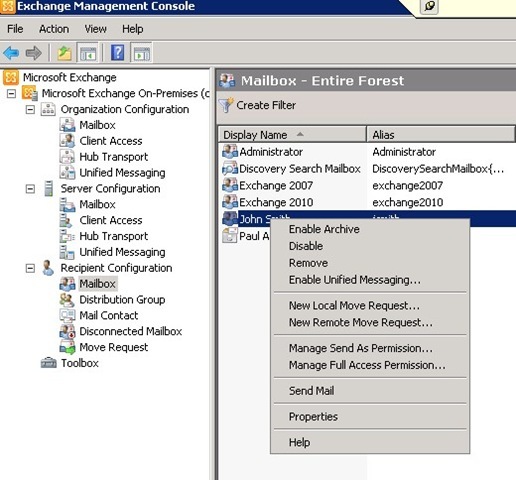 This is an extension of the Management Folder’s feature from Exchange 2007. In 2007 however, users had to place email’s in certain folder’s, be it inbox, or a created folder, so that the policy’s were enacted properly. 2010 uses the concept of Retention Policy’s as well as Retention Policy Tag’s to enforce these settings. Retention Policy Tag’s are classification’s that are set for a folder or a type of item. For instance you can create a Retention Policy Tag for the inbox, and set it to archive anything over 90 days. You could also set a Retention Policy Tag for any calendar item over 180 days to delete and not archive. You would then group this tag’s into a Retention Policy, which would then be applied to a mailbox. 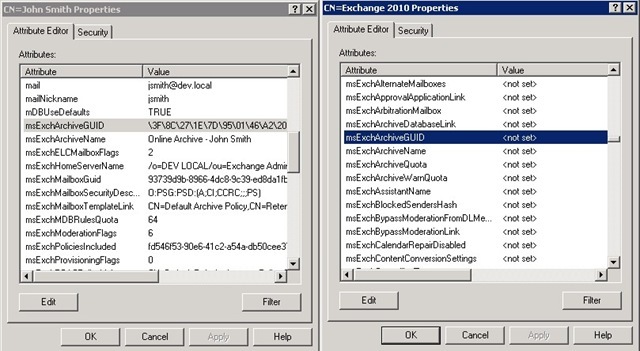 By default, Exchange 2010 comes with two retention policy’s, Default Archive Policy, and Arbitration. So according to the Default Archive Policy, the user can tag items as one of the three personal setting’s, and then have it moved to archive after the specified time, and anything not tagged will be moved to the archive after 2 years. Retention Policy’s base the time or age of the message on when the item was delivered, or if the item wasn’t delivered (such as calendar item or post), when the item was created. The Arbitration Retention Policy is used for moderated mailboxes. Moderated mailboxes are used for users who mail must pass through a manager for approval first, or for group membership approval. This policy should only be used in conjunction with these type of mailboxes. One thing to keep in mind is you cannot mix Retention Policy’s and Managed Folder Mailbox Policy’s. If we navigate to the each user in ADSIEDIT, you’ll see some other difference’s in available attributes. The three in particular are msExchArchiveGuid, msexchArchiveName, and msExchMailboxtemplateLink. Notice how the user on the right the value’s are blank, and how they are populated on the John Smith user on the left. Also, notice the msEchMailboxTemplateLink value. This is the retention policy applied to this particular user. 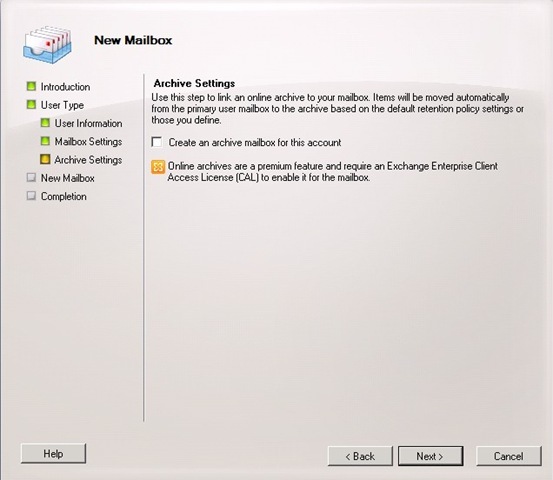 In this first part, we discussed the new Online Archive Mailbox feature of Exchange 2010, its concept and purpose, and then discussed how administrator’s can apply them using Retention Policy’s. In part two of this article. We’ll get in and get our hands dirty, and start applying policies, and seeing how Exchange manages and move’s item’s accordingly. I cannot find part 2 – And thats the bit I need! One question about Exchange retention policies. What happens when you change a retention policy length? does exchange put emails that no longer meet the archive criteria back into the user mailbox? Moderator: Please remove the above two posts. Changing the policy from say 3 months to 6 months will NOT move mail back to your inbox from Archive. Where is part 2 ? Silly question: Does “Move to archive” action really move items from the mailbox to the archive or just copies them? This question arises from the following fact: according to http://technet.microsoft.com/en-us/library/dd297955%28printer%29.aspx an administrator can have “a DPT with the Move to Archive action to move items to the archive mailbox in 2 years, and a DPT with a delete action to remove items from the mailbox in 7 years. This results in items being removed to the archive in 2 years, and items being removed from PRIMARY and archive mailboxes in 7 years”. Question that seems to be never answered, where is the PART2? Hello, I realize this post is a bit old but I’m hoping someone can help. I can’t seem to find a way to archive the inbox. When I try to create a retention tag on the inbox, it fails and says it will only work with default folders, so it will only let the inbox go to the delete options. Is there a way to archive inboxes? Can we setup a policy for archive mailbox , that all mails in archive mailbox older that 3 years will be deleted ? I think a lot of your readers will only get that far.